If you'd like to link to a document from within a Course overview, Lesson, Quiz, or Assignment, you can do so using the hyperlink tool in the text/WYSIWYG editor. To upload a link to a document using the WYSIWYG editor, simply upload the file using the 'Upload Fille' Button ( the little document icon). This brings up a modal. 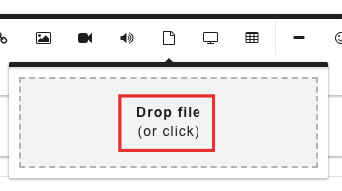 Navigate to the file by clicking on the 'Drop file (or click)' button and browse for the file on your desktop, or alternatively drag your required file to the modal. This uploads the file to your module and will be presented as a link.